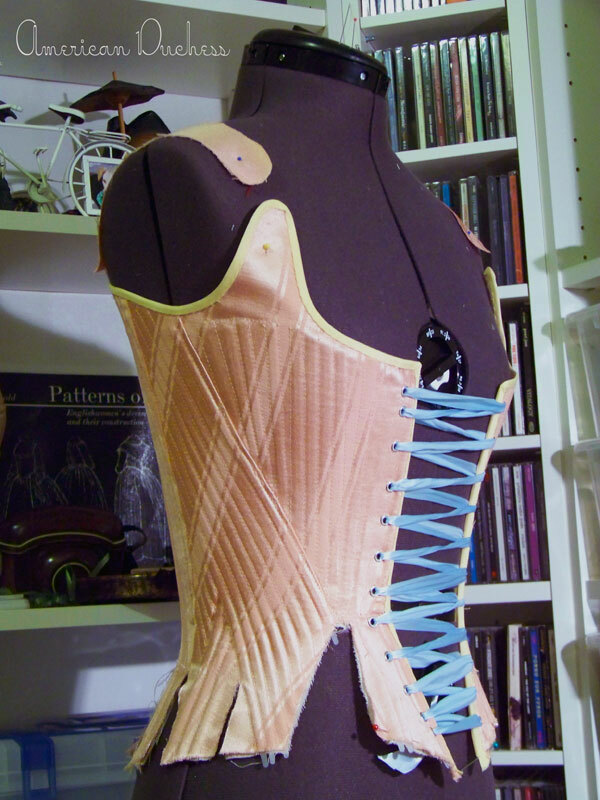 More work on the test garment that will help me fit Olympe's stays. I've installed all the boning as well as the grommets (to be covered in threads in the future). 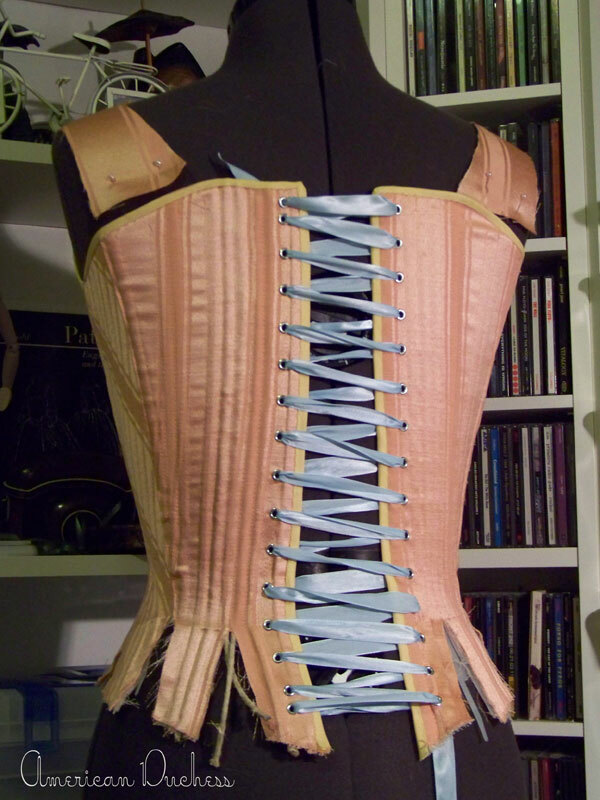 I've discovered that the stays will need to be bound for trying on, as bits of boning stick out from the tabs, and I don't want anything falling out. This goes fairly quickly with certain Jane Austen movies playing in the background :-). Use "monster" zipties, those incredibly long 1/2" wide giants you find in the hardware store. This is a good solution because it provides the most support and stiffness, particular useful on edges where lacings cross. Use thick hemp cord. Provides moderate shaping, is flexible and comfortable. Double up the 1/4" zipties, threading one in from the top and one in from the bottom. This is still in "testing" as I do not want them to migrate to the middle. The stiffness seems good, but they need to stay extended from top to bottom. The tabs on the side and back will probably be fine, but the front cut for the front tabs is too high. They should start at or just barely below the waist, so this will need some adjustment. The stays may be a little short-waisted overall, but this is an easy fix. Underarms might need to be trimmed down a bit for comfort. I'm thinking of shrinking the little tabs that stick up on the front of the stays, and extending the removable straps down to meet them, so that when the stays are worn without straps, the little tabs won't be as sticky-uppy. I will have a better idea of the exact sizing when Olympe tries these stays on. The gap in front or in back (or both) may need to be widened or shrunk. 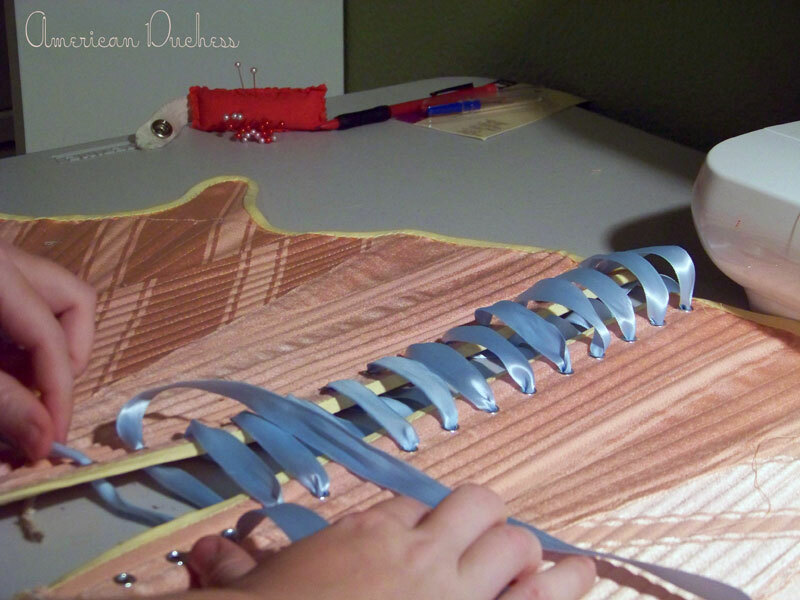 Lacing the back, using zig-zag lacings and nice wide ribbon. 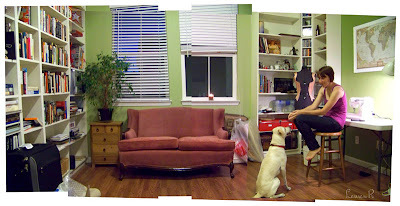 In other news, I've moved the lot of my sewing room from my apartment to Mr C's house, which is now my house too :-). I have the loft space at the top of the stairs for my little nook. It's my favorite place in the house, has lovely light (for good photos! ), one whole wall of shelves and then some, a little closet, a perfect space for my table and sewing machine, and also the Coolest Couch in the World. I'm vowing to keep the space clean, to not ever pile anything on the couch (must remain pristine! ), and keep all my notions, patterns, and bits organized on the plentiful shelves. What a wonderful space to work in! 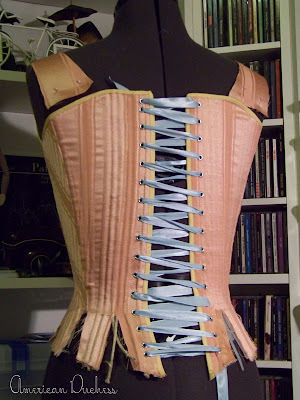 I said it before on facebook, but I'll say it again: I love that it's spiral laced! The test stays really are practically going to be a fully-functional garment. I think that the giant zipties are probably the way to go. It looks beautiful and I can't wait to try it on! What a marvelous space! (I also sew to Jane Austen ;) ). Yep, the test stays are "real" stays, and I plan to finish them. Of course, they will not be perfect for Olympe (I will be surprised if they are), and while their main function is to act as a mock up so I can alter the pattern for Olympe, I do plan on either keeping these pink stays for myself, or selling them on Etsy.